Bastila (pronounced basteela and sometimes transliterated as bisteeya) is a pigeon pie, a sumptuous, utterly rich, and magnificent preparation made for special occasions in Morocco such as holidays, weddings, or when esteemed guests arrive. The pie is surrounded by a very thin pastry leaf called warqa (which means "leaf"), the top of which is sprinkled with powdered sugar and a lattice-work of ground cinnamon. 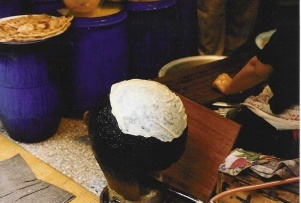 Warqa pastry begins as a spongy dough that is tapped or slapped against a hot convex sheet of pounded metal, a kind of pan called a tubsil set over a hot charcoal brazier, in a series of overlapping concentric circles to form a large film of pastry. This collection of leaves, now forming a whole thin sheet, is carefully but quickly peeled off the metal and set side. Warqa pastry is thinner than phyllo pastry, although phyllo pastry is what I use in the bastila recipe. If you wish to make your own warqa pastry, excellent instructions with suggestions for alternative equipment are found in Paula Wolfert's Couscous and Other Good Foods from Morocco and very helpful photographs are found in Robert Carrier's A Taste of Morocco. The name of the pigeon pie, bastila or bastal, comes from the Spanish word for pastry, pastilla, after the transformation of the phoneme "p" into "b" that is specific to the Arabic language. D. Francisco Javier Simonet's Glosario de voces ib�ricas y latinas usadas entre los moz�rabes (Glossary of Iberian and Latin words used by the Mozarabs) tells us that bestila [sic] is the Mozarab pastel from the Latin pastillum, a diminuitive of panis, "bread." This Mozarab bestila becomes the dialectal Moroccan Arabic besthila [sic], also meaning "pastel." Rudolf Grewe, a researcher of Hispano-Muslim cuisine, thought that the dish called judhaba in the anonymous thirteenth-century Hispano-Muslim cookbook, a chicken pie enclosed in many paper thin sheets of dough, was a clear antecedent of the Moroccan bastilla. Contemporary Moroccan cuisine is essentially an Arab and Hispano-Muslim cuisine set upon the foundation of an older and simpler Berber sustenance diet, with outside influences from sub-Saharan West Africa and colonial-era France. The Arabs arrived in Morocco soon after the death of the Prophet Muhammad and continued on into Spain by the early eighth century. The Arabs and Muslimized Berbers in Spain merged with the existing Hispano-Roman population then ruled by the Visigoths, a German military aristocracy, and they later came to be known by historians as Hispano-Muslims and by popular writers as Moors. Between 1462 and 1615, this population emigrated to Morocco and other areas of North Africa as a result of the Christian Reconquest of Spain and governmental policies that led to the Great Expulsion of 1609-14. Paula Wolfert suggested in her cookbook of Moroccan food that b'stila [sic] was not a Hispano-Muslim influenced dish because she could find no trace of the dish today in Spain, and it seemed inconceivable to her that such a great recipe disappeared. She no longer maintains this, but was led to believe it years ago based on her conversations with the leader of one of the Moroccan Berber parties who was a gastronome as well, and from her reading of Emile Laoust, a French scholar of the Berbers who taught in Rabat in the early part of this century, who described bestila [sic] as chicken cooked with saffron, which Wolfert presumed to be a Berber word describing the base stuffing for the bastila. Although the point is now moot, this never seemed likely to me for several reasons. First, the contemporary nonexistence of a similar pastry pie in Spain does not seem compelling. Ninety-five percent, if not more, of the dishes described in the great Italian and Spanish cookery works of the fourteenth through sixteenth centuries no longer exist. These were famous dishes of their day, yet there are no vestiges of them. Ninety percent of the black pepper and spice trade that made Mediterranean cities so fabulously rich went to northern Europe, whose cuisine today is anything but spicy. So what happened? Food tastes change more frequently and rapidly than scholars of nutrition and diet have led us to believe. On the other hand, a closer look perhaps reveals some evidence of vestigial remains of the bastila or pastel around the Mediterranean. 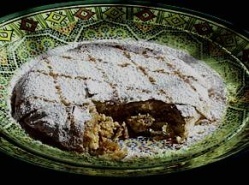 Perhaps the original Spanish dish migrated to Turkey with the Jews, as suggested by Claudia Roden's description of the dish called pasteles of the Turkish Jews. Patricia Smouha, the author of a Middle Eastern cookbook, also tells us of an "old Syrian dish" called pastelis [sic], which is a pie stuffed with either fried beef, onions, and pine nuts or brains. In any case, we know that as late as the sixteenth century, Spain's King Philip II was still eating pastel. That pastelis traveled is not in doubt. Besides the evidence of the eastern Mediterranean, pastelis eventually appeared in Puerto Rican cookery stuffed with almonds, raisins, and cornmeal. There is other evidence of the Andalusian origins of and inspiration behind bastila. Andalusia had a rich court life under the Spanish branch of the Umayyad dynasty (756-1031), and the Almohad (1130-1269) and Nasrid (1230-1492) caliphates and a concomitantly rich cuisine, whereas the Berbers did not. Pre-Islamic Berber cooking in Morocco was subsistence cooking, not cuisine. The French were making a kind of pie or cake called pastillus, a word that was transformed into gastellus, guastellus, wastellus, and gastiel, all names of different stuffed cakes that appear in texts from 1129 to 1200 in the areas of Champagne, Ile-de-France, and Picardie. It was a luxury pastry made with very fine, good-quality flour, and stuffed with meat or fish and spices and fat, corresponding to the Moroccan bastila. The term crosses the English Channel, where the Scottish king William the Lion serves wastelli dominici to Richard the Lion-Hearted. It also appears in yet a different guise in Sicily as guastedde or vastieddi, a kind of spleen calzone. It still appears today in Corsica as bastella, a meat and vegetable filled pie pastry.